Ordinarily given to commentary and analysis of contemporary art, from painting to photography, film, architecture, design and more, the Modern Painters’ Art & War edition is indicative of what bubbles just beneath the surface of the art world. 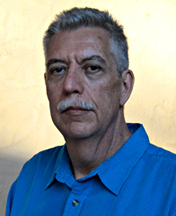 Editor Susan Morris struck what for me seemed a positive note, when she wrote in her editorial statement that the magazine’s staff; “began to wonder about art and activism, art in the age of terrorism, the nature of propaganda, and the role of art in wartime. The stories in this issue are, we hope, the start of what will be a continuing conversation.” A single issue of a magazine is of course not enough, but it is a step in the right direction towards developing a questioning and contentious aesthetic. Morris’ words are pleasing to my disposition, since what she describes is in actuality the general direction this web log has taken since its inception. It’s not often that my name is mentioned in the same breath as that of Karl Rove, so you will excuse my wanting to share the following with you, but it’s one of the finer points made in Merjian’s article that has to do with the complexities of language, visuals, and of articulating views outside of acceptable mainstream parameters. 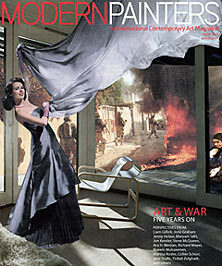 The April edition of Modern Painters also carries several other commentaries, columns, and reviews of note. In the article Display Tactics: Political Curating, freelance curator and critic, Tirdad Zolghadr, challenges the effectiveness of recent exhibits that have addressed the Iraq war. Five Years and Counting is a portfolio of images from over a dozen of today’s artists who have created works in opposition to the Iraq war. Home Delivery: Martha Rosler’s Photomontages, is Richard Meyer’s essay on the fierce cut and paste montage work of Rosler, who has four stunning works in the magazine’s pages, plus - she created the powerful cover art for the magazine. No doubt of interest to artists, activists, and academics, Modern Painters’ Art & War edition is available on newsstands most everywhere. That the advertising company behind this jingoistic marketing blitz decided on martial language for its promotion is bad enough, but the ruthless slogan is coupled with a militaristic image that conjures up the brutality of war. 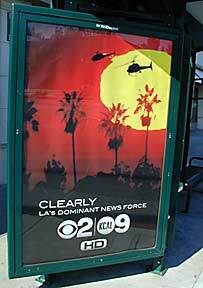 No doubt the ad execs responsible for the campaign will stand behind the subterfuge that the image simply represents the CBS/KCAL fleet of helicopters flying over the city against a backdrop of L.A.’s ubiquitous palm trees, but look again, what’s that you see - Vietnam? 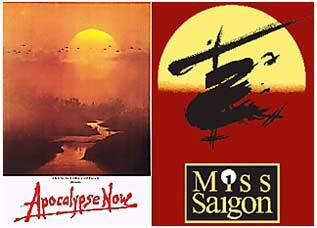 A quick glance at the official theatrical posters for the musical Miss Saigon, and the movie Apocalypse Now, tells you exactly what served as an inspiration for those ad execs behind the CBS/KCAL campaign, but honestly - someone should tell them that the U.S. lost the war in Vietnam. Or could it be that the CEO’s had the Iraq war in mind when they approved the billboard and bus shelter graphics? Perhaps they hoped that by equating the journalists of CBS/KCAL to U.S. soldiers in Iraq, some of that “support our troops” sentiment might rub off on their broadcast clients. Such an ugly and perverse display of venality coming from the commercial advertising world cannot be discounted. At any rate, whatever the impetus behind the CBS/KCAL ads might be, they are a picture perfect example of what I like to call, Totalitarian Postmodern, a dangerous aesthetic that threatens and undermines democratic values. 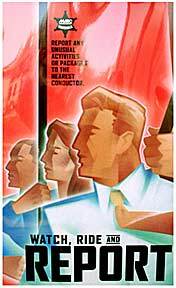 The poster depicts train riders steadying themselves in their seats, holding on to safety straps and poles, but the style of the artwork is also a direct reference to the politically charged Soviet posters of the late 1930’s. The train riders even appear to be holding red flags, but instead of a slogan like “Long live the great unity of the working people of the world” the poster instead calls on viewers to “Report any unusual activities.” Such wording conjures up George Orwell’s, 1984. In that tale of a horrifying modern dystopia, constant surveillance of the population by the one-party state was the order of the day, with the populace encouraged to spy on and inform against itself. In 2002 a similarly Orwellian poster was issued in London by the Metropolitan Police working with the CCTV, London’s mass transit provider. That unnerving poster bore the slogan, Secure Beneath The Watchful Eyes - the watchful eyes of the police of course, and the poster confronted rapid transit users all across the city. It is interesting to contemplate how the Watch, Ride and Report poster was sanctioned by The MARC Train Service to begin with. No doubt an advertising agency was used to create and print the artwork, which entailed artists and designers, copy writers, proof readers, editors and of course department managers who would approve the work as it progressed. Finally, the poster had to be approved by MARC and its managers and directors. And yet, while passing through all of those hands not a soul objected to the blunt authoritarian style of the artwork. Despite the fact that I’ve noted the totalitarian postmodern style used in tongue-in-cheek commercial advertising before, what makes the MARC Train Service poster different is that it offers no irony or humor. Instead it is a serious poster concerning public safety measures and law enforcement in a time of color coded terror alerts, increased FBI powers, and Homeland Security surveillance. That a people professing allegiance to democracy and human rights could be reassured and comforted through the use of aesthetics utilized by dictatorial regimes should be a cause for concern, but then, we live in exceedingly bizarre times. The totalitarian postmodernist style is not just restricted to announcements from the “public sector”. As I mentioned previously, it is a deeply rooted aesthetic in modern commercial advertising, though it does not always have such an obvious political veneer. An excellent example of this would be a billboard I saw on a heavily trafficked boulevard in Los Angeles just prior to 9-11. The huge billboard was an advertisement for a major department store, and I regret not having taken a photograph of the offensive display. The gigantic minimalist ad featured nothing but bold white text centered on a unadorned green background, with the store logo tucked away in a corner. The billboard simply read, SHUT UP AND SHOP. 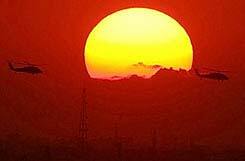 But that’s the subject of another essay.